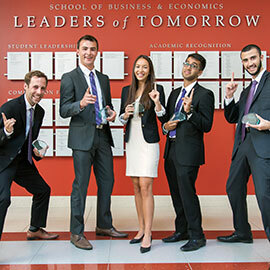 The Lazaridis School of Business & Economics crowned its winning team for the spring 2016 term Integrated Case Exercise competition, or ICE Week on July 22. ICE Week serves as an opportunity for third-year BBA students to integrate management disciplines into a real-time problem-solving context while experiencing work-world pressures, developing presentation skills and interacting with business executives. It is one of the most anticipated and memorable experiences of the BBA program. For the spring 2016 ICE Week, 100 third-year BBA student teams of four or five were tasked with making recommendations on how they could grow Unilever Canada’s personal care division with existing Unilever products. Students were given constraints on what they could do: for example, they were not allowed to create new products or to change the formulation of existing products. Instead, teams were asked to think outside the box, considering new customer targets, distribution channels and strategies for existing products. Unilever Canada even went a step above to provide travel kits to all participating students with products from their personal care brands including Dove, Axe and Qtips. This allowed students to actually see and try some of the products they were working to market. What made this ICE Week even more special was that there were three Lazaridis School graduates representing Unilever Canada as part of the judging panel: Danika Johansen (BBA ‘07), Bobby McMaster (BBA ‘14) and Carrie Sparfel (BBA ‘12). The trio was joined by senior-level Unilever Canada executives Jessica Grigoriou and Vito Francone for the company Q&A session and to evaluate the final presentations. The four finalist teams all rose to the challenge and had very diverse presentations that impressed the Unilever Canada judges for their depth of research, creativity and solution to the problem question. Team four’s Brendan Clark, Tomas Cruells, Marina Jackson, Shaiyan Khan and Sean Kimmerly took home the top prize after exciting Unilever Canada with their proposed innovative partnership with Airbnb, Shopify and Amazon. "I had a great time working with Unilever Canada to come up with a case focus that would be challenging for the students and be relevant and impactful for Unilever Canada," commented Karin Schnarr, an assistant professor of Policy at the Lazaridis School and the faculty case lead for ICE Week. "Unilever Canada has been such a strong supporter of Laurier students and they were wonderful partners for ICE Week spring 2016." The Lazaridis School’s next ICE Week competition will be held in March 2017. Those who are interested in being an alumni judge or in having their company featured in a future ICE Week case study should contact Graham McCormick (gmccormick@wlu.ca).